Doffing his dressing gown, Mulligan likens himself to the Savior humiliated by Roman soldiers: "Mulligan is stripped of his garments." In Scylla and Charybdis Stephen follows suit, reciting apparently for Mulligan's benefit (he has just been thinking of the "Brood of mockers: Photius, pseudomalachi, Johann Most") the fact that Jesus, "stripped and whipped, was nailed like bat to barndoor." 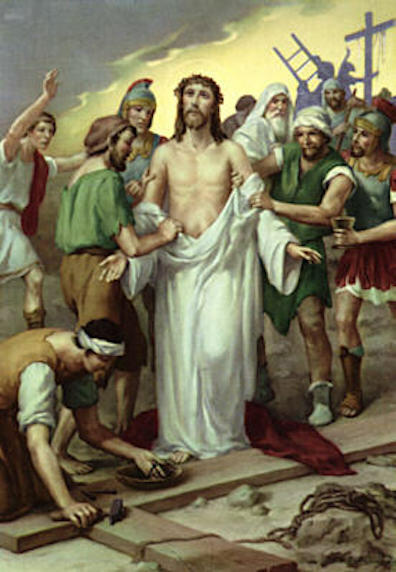 This event from Christ's passion is one of fourteen stages in the Catholic devotional practice called the Stations of the Cross. The Via Crucis is a numbered series of narrative images through which western Christian churches commemorate Christ’s journey down the Via Dolorosa on his way to crucifixion. Practitioners proceed from one image to the next, contemplating Christ's sufferings and spiritually aligning themselves with him through meditations and prayers. The tenth of the fourteen stations, "Jesus is stripped of his clothes," echoes Matthew's gospel: “And they stripped him, and put on him a scarlet robe” (27:28). Of the flippancy exhibited by Stephen no less than Mulligan, it may be observed that repetitive religious ritual employing bad art has the capacity to dull response rather than excite it. The 10th station, by an unknown artist. Source: www.catholicculture.org.